Small Businesses Are Under Attack now more than ever before. Let’s face it the tech giants have the resources to focus on the data security of their customers and users. Even though they spend millions of dollars on data breach-prevention tools and policies they still sometimes have issues. Protecting data is especially critical for small businesses now that they have become the primary targets of Hackers. It is common knowledge that small businesses have less resources when it comes to data protection. Small businesses can have great products and services but just not understand the importance of cyber security. It can be devastating when they suffer a hack or misconfigured database that exposes sensitive information online. A survey conduced showed that nearly 90% of small business owners don’t feel like they’re at risk of experiencing a breach. This is pure insanity given the number of state sponsored hackers, cyber criminals combined with human errors. “Experts say these kinds of attacks can be so damaging to revenue and customer expectations that small businesses are forced to close,” according to the New York Times. The most dangerous part of why small and medium sized businesses do not spend valuable resources on breach-prevention is that they can not understand or estimate the monetary or reputation cost of a data breach until it is too late. With the average cost of a Data Breach in the USA at $7.35 million it is a valuable lesson to learn before a breach happens. According to the IBM and the Ponemon Institute Cost of Data Breach Study the numbers are staggering to say the least. 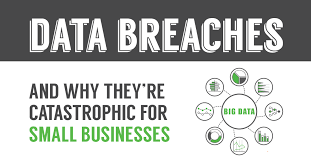 The numbers and data show the real cost of a data breach but yet many business owners and executives struggle to spend resources on something they can not fully understand. The real cost is the loss of customers and damaged reputation the company suffers. The average U.S. business paid $4.13 million in loss of customers costs. The average U.S. business paid $1.56 million in post data breach response costs. This would include things like professional reputation repair services, PR campaigns, cyber forensics, and much more. Then there are Notification costs that can be extremely high if you factor in fines or other expenses involved in being legally required to disclose a data breach. The bottom line is that The Benjamin Franklin axiom that “an ounce of prevention is worth a pound of cure” is as true today as it was when Franklin made the quote. Franklin actually was addressing fire safety but as times change the quote applies to the digital world we live in.